Magpie's early, since it's a holiday week here in the US. So glad for the extra day! Great picture. so, I'm REALLY late with last week's and actually early with this week's MAG...so maybe I break even? ;) Happy Thanksgiving! To Willow and everyone, have a wonderful Thanksgiving! Make it truly meaningful: Don't shop! Relish this holiday for it's blessings, it's meaning, and for the chance to spend quality time with loved ones. The stores and malls will still be there next week! i hope this reaches you Magpie! still a bit wobbly with links.Anyway here goes. Second try!! must be extremely wobbly on the linky. Here's hoping! Hi Willow, didn't realise you were posting so early, my link is actually for last week's picture so I hope thats ok? I will get on to something for current prompt, promise! Another poem that falls outside the prompt pic, I'm afraid. And this one is wrapped up in a longer post that - so far, anyway - seems to have deterred all but the most dedicated of blog readers! So if it's pure verse you're after, vault over the prosey bits and land on the poem! (Although I'd love to hear from anyone who's got time for the whole package). Loved this picture. Happy Thanksgiving, everyone! This is my first Magpie without the photo prompt because I wrote it before I saw this. It was perfect. My Cup Runneth Over! Willow I messed up I think 23 is from last week. I am not sure how I did that but my brain (I almost wrote brian lol) is tired! I will definitely compose a poem, its time to exercise my mind. thanks for this opportunity! Wow, a lot of cup runneth over here! Mine touched on that as well, must be the season! Well, my name is there, but whether the link will work remains to be seen! What a surprise - it won't! I'll try again. Done it. And it was a fun one to do. I hope all my friends in the USA are enjoying their Thanksgiving week. This one was a challenge for me. I ended up going minimalist with a haiku. Happy Thanksgiving to all those who celebrate it, and I am thankful for this place of inspiration and community. Hi Willow and fellow Magpies, I did a Magpie last week about a doll, I found an old childhood photo of me, my sister and the doll if anyone interested its on my blog. Thanks, as always,..and a wonderful Thanksgiving, to you, to all!! This is my first try at Magpie. I look forward to it. Not much of a Thanksgiving poem, but a poem nonetheless, hopefully. Now I can devote myself to the important things, like cooking and eating. ;) Happy Thanksgiving, all. 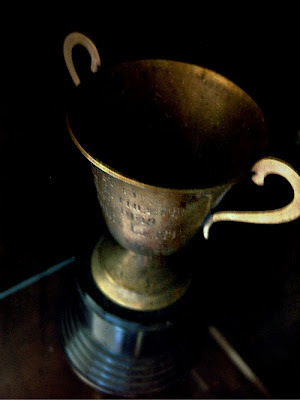 The winning cup for Magpie!! Your photos are story teller!! Nostalgic shoeboxes filled with precious memories... Happy Thanksgiving everyone. Everybody's goin' all bicycle on me, I couldn't resist. I realize that the picture is of a loving cup and my story is centered around a mug of tea....but perhaps you'll allow me the stretch? A quick one, this week. It's not vacation season here but my brain's on holiday (read to find out). wonderful prompt...thank you, once again. Happy Thanksgiving to US!! !I feel celebratory and watched all day yesterday the Macy Parade! Even tried to have mockturkey! Then watched Miracle on 34th Street! Love that show! Both the old and new versions! Now for Black Friday power shopping dreaming! With Tgiving and lousy weather, I'm surprised anything emerged. It did, in layers, differing parts at differing moments for differing apparent reasons to yield what seems like a 'whole'. Work is standing in the way of my inspiration and imagination but I tried!!! Most likely my longest story yet. Oddly it may be lengthy yet it's all about everything that is superficial. Cheers! You inspired me to pen a short story as well willow. Entitled "Winner", but I'm not sure about that. Loved reading the earlier entries - I've posted, it's not me at my best but I think it holds. Thanks as always - hope you're having a great thanksgiving weekend! Love this pic! Thanks Willow! I hope you all had a great Thanksgiving! Enjoy the rest of the weekend. Lovely prompt (as usuall) and inspiring - winning and losing, jing and jang...life. Thanks for another wonderful photo. I trust that your Thanksgiving was good. Oh, I missed my new obsession. Just a short one this week. I can't wait to read your tales. I'm unable to enter this week, but I'll still be here to have a read. I'm glad to be on the list, now I'm making the tour! We're here as fading blooms. coming inunder the wire, but better late than never...smiles. I came in under an even lower wire than Brian, ds, and kavisionz. There is room for still more late-comers, however! Hey, nobody's considered late until Tuesday afternoon. Come on, jump in! The water's fine. I just stumbled upon this parallel universe of poetry for the first time today. Seems worthy of exploration, and capable of inspiration. I cannot keep up reading all the contributions to Magpies. I almost repeated something I wrote before way back when we started but I did get a new inspiration, so I'm on with this prompt. Can't wait to read some others too.